Though they were rewarded with exceptionally nice weather, the wind abandoned the lake later in the day, after only one very light wind race was sailed. 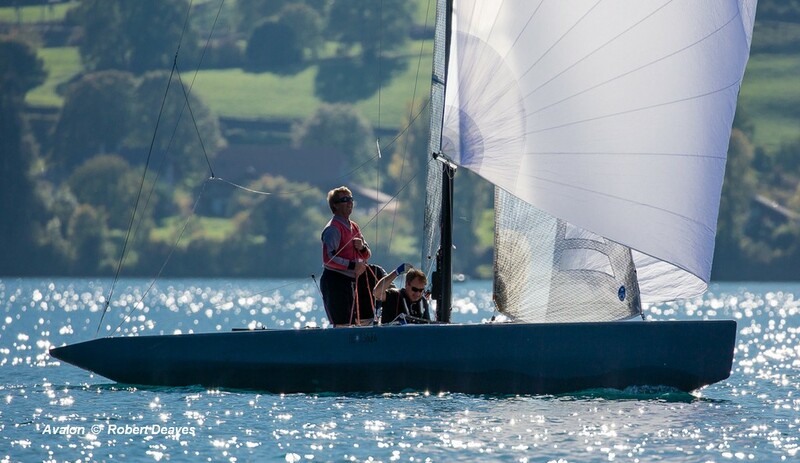 Avalon, SUI 210 of Beat Aebischer, Aaron Teuscher and Christof Gerber took the win after leading at every mark. The nice morning and early afternoon breeze began to fade as soon as the fleet set sail and during the single race sailed, it was never more that 3-4 knots. There was a huge split left and right as boats looked for pressure closer to the shore. Avalon rounded first from Marie-Françoise XIX, SUI 228 (Jürg Menzi, Dino Fumasoli, Christof Wilke), who had made up a lot of ground on the right after a poor start, and Otto, SUI 209 (Bent Christian Wilhelmsen, Lasse Bertelsen, Espen Espen). By the leeward mark, New Moon, BAH 21 (Christoph Burger, Renato Marazzi, Peter Vlasov) were up to third and then moved to second on the final upwind. The final downwind was crucial, with Avalon covering Marie-Françoise XIX while New Moon split from the leaders towards the northern shoreline. It didn’t pay off though with Marie-Françoise XIX moving back to second at the final downwind to follow Avalon up to the finish. New Moon crossed third as the wind fizzled out in the autumn sunshine and the boat inched across the finish line.